These days, when we're talking about reservoirs and lakes in California, it's normally using words like "historic low" and "unprecedented drop". But thanks to recent heavy rain, California's largest reservoirs are finally getting back to normal. 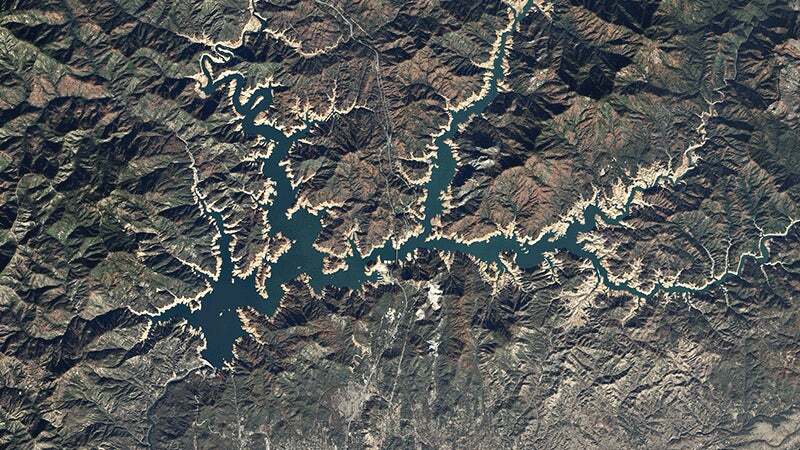 A series of images from NASA's Landsat 8 satellite show the changes in Shasta Lake, California's largest reservoir, over the course of the last year. From its low last November, El Nino has driven water levels up by just over 40m, from 278 to 319m. The amount of water in the lake has actually tripled since December, and Shasta is now above the historical average for this time of year. To be clear, this doesn't signal the end of the drought: the northern reservoirs, while big, aren't representative of the state's water capacity as a whole. Across California, water storage is still below average, and the groundwater supplies have been drastically reduced by years of over-use. In other words, Californian residents shouldn't go having any pool-and-lawn-watering parties just yet.